Over a year ago I discovered some delicious little individually wrapped dark chocolates at Whole Foods. They were right up my alley at only 26 calories each, and so I began buying/eating them regularly. Then all of a sudden one day, they stopped carrying them which was really disappointing for me (I think a lot of us have had this happen -- it is so frustrating when it does!). I kept looking for them, but I had no luck finding them so I gave up. In order to compensate, I began to eat Trader Joe's Chocolate Wedges instead. I love the Chocolate Wedges, but I missed the yummy thin dark chocolates from Whole Foods. Then, after months of not being able to find my chocolates, I came across a sample station at Whole Foods last weekend that consisted of a plate full of individually wrapped dark chocolates. They were wrapped in red wrap (instead of shiny purple wrap like before) so I didn't recognize them at first. But, once I opened one up, I was delighted to find my precious flat dark chocolate inside. The chocolate hadn't changed at all, but the wrapping and packaging was totally different! I'm so happy to have my chocolates back! 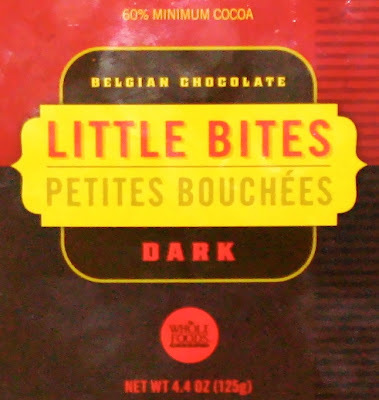 These "little dark chocolates" are officially "Belgian Chocolate Little Bites (Petites Bouchees)", made by Whole Foods. As I mentioned above, each one is 26 calories, and two of them are only 1 weight watchers point. I find them to be really satisfying when I'm having a chocolate craving (which happens about once a day). Question for you -- Have you ever had one of your favorite foods disappear from the supermarket? If so, what was it? This chocolate looks delicious!! My favorite oatmeal disappeared! Smart Balance Instant Oats!! They tasted amazing but got discontinued! yum! i know that i've had similar experiences but i can't remember which products. Okay, so it's not exactly healthy, but I used to use fat free "I can't believe it's not butter". I was able to bake with it and use it for everything that butter would be used for. And it's goneeeeee. :( I don't know what happened. Glenny's Soy Crisps:( Whole foods carried them at such a great price, much lower than the Glenny's product website. Also Pilsbury used to me Sugar-Free cookie dough.. discont. Oh my, I need to find that chocolate!!! TJ's discontinued these awesome cinnamon-bran scones. Four points, a great portable breakfast, and delicious when warmed. Sigh.